The recent slowdown has called previous narratives about China’s rise into question for some. How should we view this economic slowdown? What role will the US play? Global Times (GT) London-based correspondent Sun Wei interviewed Martin Jacques (Jacques), a senior fellow at the Department of Politics and International Studies, Cambridge University, and a visiting professor at Tsinghua University, Beijing, about these questions. GT: Nobel Prize winner Joseph E. Stiglitz claims in an article that the “Chinese century” has begun and that Americans should take China’s new status as the No.1 economy as a wake-up call. Professor Joseph Nye of Harvard University explains in an essay why the “American century” is far from over. Obama said last year the US will lead the world for the next 100 years. What do you think of these debates? Jacques: The US is still the dominant power in the world in probably every sense. China is only challenging it economically by virtue of having a huge population. China’s rapid transformation is clearly already having profound economic consequences, and beginning to have serious political, cultural, intellectual, moral, ethical, and military consequences as well. That’s in a way what President Xi Jinping‘s government represents. The Chinese dream imagines a different place in the world and a different future for China. 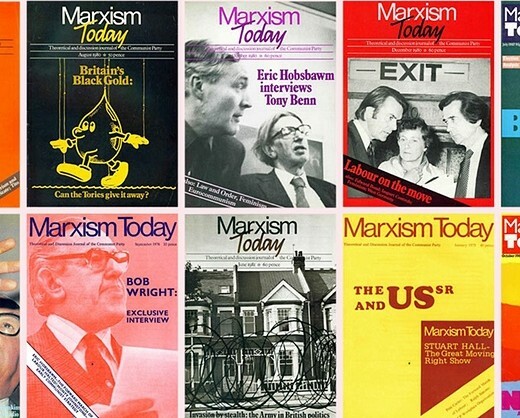 John Harris’ ‘Long Read’ piece for The Guardian (29 September 2015) includes an interview with Martin Jacques and an assessment of his editorship of Marxism Today from 1977 – 1991. The second watershed text that Marxism Today published was a piece titled The Great Moving Right Show, written by Stuart Hall, the pioneer of cultural studies who would become Marxism Today’s most insightful thinker, and one of Jacques’s closest friends. Written in the somewhat chewy language of cultural and political theory, it was an analysis of what had been quietly happening to politics – and Britain at large – since the 1960s, and which was now being taken to a new level by Thatcher, despite the fact that she was still keeping her brand of zealously free-market economics somewhat hidden. Throughout the 1980s, Jacques and his writers carried on unsettling the left, in often delicate circumstances. Tempers were frayed by Marxism Today’s occasional habit of giving space to dissenting voices from the eastern bloc. In 1981, a leading British Communist called Monty Johnstone went to Poland, and came back with not only an interview for Marxism Today with the deputy prime minister, but also a smuggled-out cassette on which he had recorded a conversation with Lech Walesa, the leader of the insurgent Solidarity movement (“I am not a good politician. I am first of all a consumer and I want something to consume,” Walesa said – probably not the most welcome words to Communist ears). Twelve months later, Jacques ran an article by the renowned dissident Roy Medvedev, which triggered a letter from the central committee of the Communist party of the Soviet Union – to the more orthodox high-ups at the British party, the equivalent of an intervention from the headmaster – which, Jacques told me, “complained bitterly about it”. Onlangs publiceerden we citaten en een samenvatting van een pessimistisch artikel over China van professor Shambaugh. Indirect in antwoord daarop publiceerde Xinhua al op 13/3 een soort interview met Martin Jacques. We nemen het hier volledig over. Het Westen heeft de neiging nu eens voor, dan weer tegen te zijn in het beeld dat het schetst van China’s toekomst, maar de opkomst van China is een blijvend verschijnsel, aldus de Britse academicus Martin Jacques in een interview met Xinhua. In een commentaar op het opflakkerende debat over “De eeuw van China” noemt Martin de reden hiervoor eenvoudig: het feit dat de ontwikkeling van China blijft doorgaan. “Westerse commentaren over China zijn grillig en hebben de neiging negatief te zijn. En dan, van tijd tot tijd, lijken ze wakker te worden en zich te realiseren dat de trend zich doorzet” verklaarde de auteur van de internationale bestseller “When China Rules the World”.